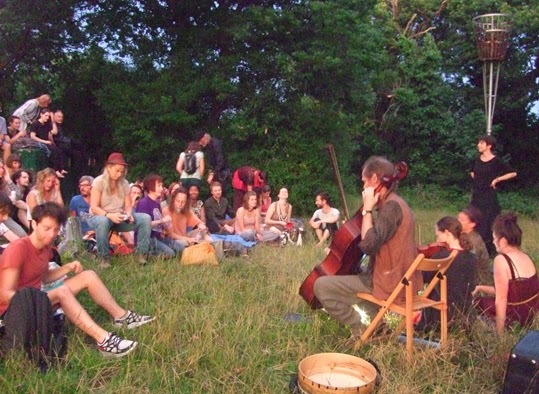 How could I resist an invitation to unveil the magic and music of the ancient gods in the twilight woodlands and venture Into the Greenwood with London Dreamtime? 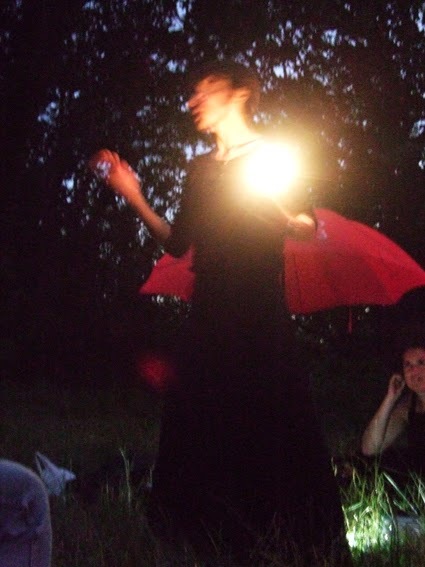 It was, indeed, an enchanting evening on Friday 18 July, led by musician Nigel of Bermondsey and storyteller Vanessa Woolf in ancient woodlands on a hilltop in south London overlooking the gleaming towers of the city skyscape. But there was also something eerie and ominous about the grey and red of the sky as dusk fell. 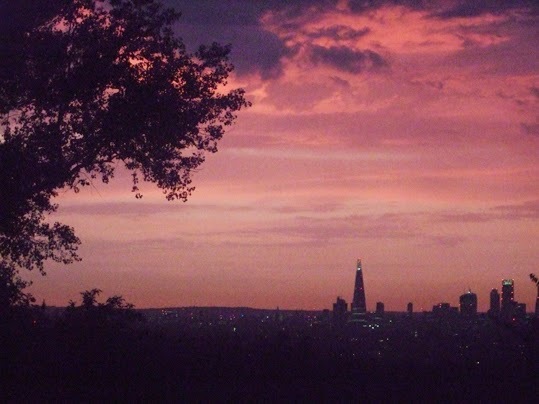 I took the photo above of the view from the hilltop and , as one friend said, "You can see the eye atop Barad-Dur." Of course I hope it presaged nothing more than the thunder and lightning storm that rolled towards us, adding extra atmosphere and effects to the songs and stories later in the night. And no one in the audience seemed to mind the cooling rain and dramatic displays of nature, and urged the performance to go on even though Vanessa asked if we wanted to pack up early and leave to avoid the threatening downpour. 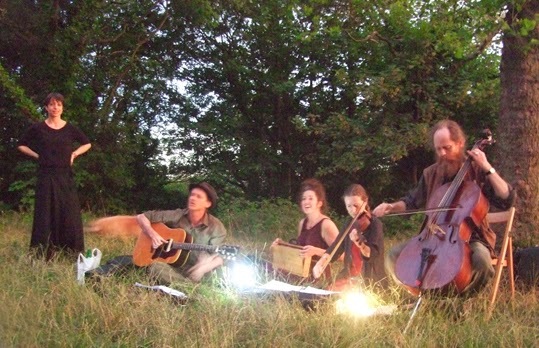 The performance was of songs about Cernunnos and Herne the Hunter - antlered gods of the wild places - about the Wild Hunt and other myths and legends of the British Isles, and also about the elm trees that still grow sheltered by the South Downs despite the blight that has killed so many since the 1960s. Vanessa told stories from when the Great North Wood spread across the country south of London and of Persephone and the Greek myth of why the seasons change. I first found out about Nigel and Vanessa through your blog (and have been silently following you ever since), so I feel sorry about missing this particular night, of all their events. I was at RIFT's immersive Macbeth in the Balfron Tower, which was a worthwhile experience, but, I suspect, ultimately not as magical.